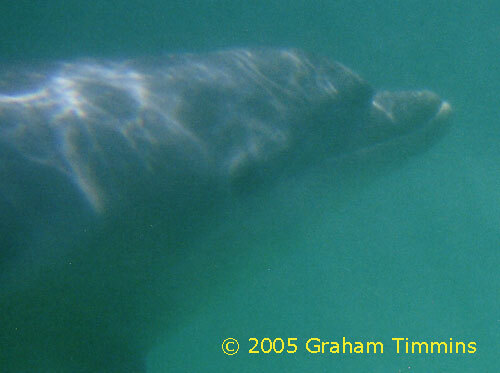 This dolphin first made herself known in Ventry harbour in the last week of May 2005. 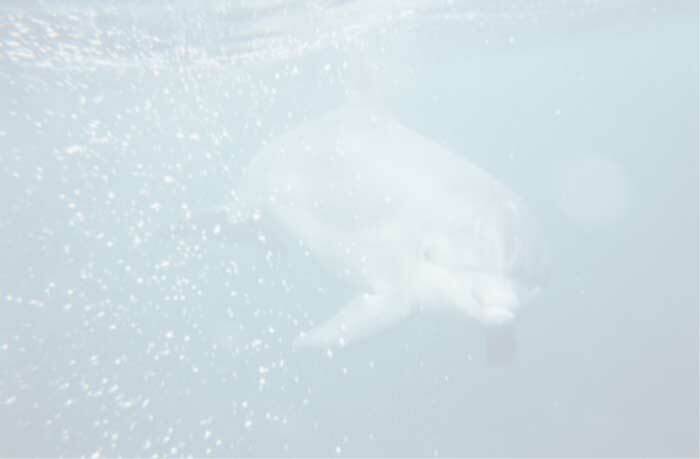 She was found and named by Ute Margreff, who was mysteriously drawn to visit Ventry even though she was in Ireland to swim with Dusty the Clare dolphin, as she has done very regularly since 2001. Ute spotted the new dolphin immediately as soon as she arrived in Ventry and felt she had a strong connection with her right from the first encounter. Venus stayed for a few days, mostly hanging around one of the mooring buoys near Ventry pier, and a number of people went out in small boats to see her. I went out in my kayak one day but Venus didn’t show interest in that as far as I could see. As far as we know, Ute was the only person to swim with her at this stage. Shortly after this, the same dolphin (as Ute later established) turned up at the Blasket Island and was seen frequently by lobster fishermen when hauling their pots. In July, the dolphin was approaching swimmers off the Blasket island beach and Ute was able to enjoy some long sessions of interaction with her. Her playfulness showed in initiating games of seaweed carrying, as with Dusty. A number of other people went out to swim with Venus, including Keith and myself (see our reports in the news section), but she never attracted great attention, perhaps because of the expense and time involved in taking trips out to the island. (In the days when Dony was on the island, the ferrymen used to bring local residents out for free and were very helpful in facilitating our swims with him, but the previous ferrymen’s co-operative has since dissolved and the competing ferry operators which have replaced it are operating under an altogether more commercial regime, unfortunately for us!). Ute however remained a regular visitor through the summer of 2005, although unfortunately she didn't get any better photos of Venus than the snapshots I took on my visit. Most of the time Venus seemed to hang out very close to one specific yellow mooring buoy off the main Blasket Island beach, although she would also swim off a short way to fish or to follow boats. She ignored visits by the general groups of wild dolphins which frequent the area and was a resident solitary dolphin for at least 6 months, so we felt she deserved a page of her own! With the autumn storms in October it was no longer possible to get out to the island to see if she was there and by the spring of 2006 she had vanished.